Did you know that research indicates the use of wood products reduces stress in environments? 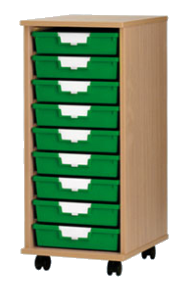 These durable storage cabinets are constructed from 3/4" high performance melamine faced chipboard with high impact resistant edge banding. 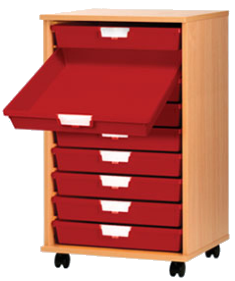 Customizable, enabling storage flexibility with any interchangeable combination of storage tray depths. Lockable heavy-duty rubber castors can support over 400 lbs. per cart. Choice of carts that are built for slim bins or wide bins.